Experience Costa Rica in the most natural way possible with the friendliest Tico family in the entire Manuel Antonio region! Our Manuel Antonio horseback riding tours guided by Don Gilberto and his incredibly kind family are one way to ensure that your Costa Rica vacation experience is as authentic as possible. Saunter off the beaten trail with our gentle equine friends who will do all the work and allow you to absorb the tranquil nature and abundance of flora and fauna at a peaceful gait. Explore hidden waterfalls and picturesque white sandy beaches on our Manuel Antonio horseback riding tours catered to your vacation needs. We have morning departures for the early risers and afternoon horseback riding tours in Manuel Antonio for those who prefer to sleep in which will also give you a spectacular view of the sunset. Taste fresh Costa Rican fruit as the sun dips into the Pacific Ocean and take a deep breath knowing that this is what the Pura Vida is all about. Saunter horseback along the beach, or take a horseback ride inland to the Tocori Waterfalls; Manuel Antonio Horseback riding tours can take you there! 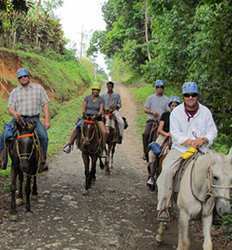 Below we have complied a list of horseback riding tours departing from Manuel Antonio & Quepos. Take a look then take your pick of equestrian adventures in Costa Rica.